I find it most remarkable that a relatively small country like Austria can pack so much viticultural punch into its limited footprint. The reason for what Austrians call “Sortenvielfalt” or a multitude of styles and grapes is the ideal geographic location of Austria. It shares the same longitude with Burgundy and is at the cross section of the Alps, the Mediterranean Sea, and the Pannonian plane. Each of these large regions contributes another component to the Austrian growing conditions and creates micro-climatic surroundings. My wife and I lived in Vienna at the historic moment when the wall came down and the iron curtain was cut open. These events helped to make Vienna and Austria again the gateway to Central-Eastern Europe and it fueled a renaissance of quality wine making and wine culture. Austria has taken the lead in this development and it is gratifying to see how vintage after vintage is getting better and better. You also find in Austria a very harmonious balance between a foundation in tradition and a very contemporary modernity. Today, in many estates you have the young generation taking over or working side by side with their parents. The Youngsters grew up with wine making, they know the vineyards and even the individual vines very well which in some cases were planted by their grandparents. At the same time they are college educated and travel the world. The wine scene in Austria is very young, creative, and competent. It’s fun to work with such great people and their products. Geyerhof, Kremstal. Owner and wine maker Ilse Meier is together with her sister Christine Saahs from Nicolaihof in the Wachau at the forefront of organic, natural wine growing and production in Austria. Both have practiced natural wine making for decades at times when they were ridiculed for it. Today of course, we all know better and many Austrian producers have adopted sustainable and organic methods in vineyard and cellar. I claim that you can taste the health and strength of Ilse Meier’s grapes when you drink a glass of one of her wines. Decades of natural growing conditions have made the vines strong and healthy and that’s what you taste when you drink a glass of wines produced with that grape material. Schmelz, Wachau. The Schmelz family works meticulously on their steep, often terraced vineyards along the Danube River. I find it most remarkable that every one of their wines is made from fruit grown in a particular, single vineyard. When you taste several of their Rieslings and Grüner Veltliners side-by-side you can always tell the different soil and growing conditions of the sites. No wonder that Schmelz was named ‘Wine Maker of the Year 2005’ by Falstaf, Austria’s leading wine magazine. Weinrieder, Weinviertel. We jokingly call Fritz Rieder, the owner and wine maker at Weinrieder the van Gogh of wine making because he is so dedicated and has so much creative energy. If you sit down with him for one of his extended tastings you encounter wine after wine which has personality and character. This is particularly true for his Eisweins. Weinrieder has been specializing in Eiswein production for more than thirty years and thus takes advantage of the fact that his vineyards are located in the northern most part of Austria. Juris, Neusiedlersee. Axel and Herta Stieglmar are specialists of Burgundian grape varieties. They inherited this from Dad Georg Stieglmar, who was one of the Austrian pioneers of using French barriques for maturing red wines. The dad’s nick name ‘Juri’ for George also became the brand name of the estate. Juris Pinot Noir and in particular their Sankt Laurent are among the finest produced. These are sophisticated, yet very approachable and affordable wines. The sour cherry notes of the Sankt Laurent which is the Austrian ‘Love Child’ of Pinot Noir crossed with a still unknown Austrian native grape pairs nicely with many different kind of foods. My favorites: roasted meats with savory mushrooms or tomato based sauces. J.Heinrich, Burgenland. No Austrian portfolio is complete without a line-up of Blaufränkisch, Austria’s signature red grape. We are very happy to work with Johann Heinrich and his family in Deutschkreutz, the heart of what is called ‘Blaufränkisch Land’. The Heinrichs are true masters of this grape, whether it is made from freshly fermented grapes in stainless-steel tanks or with some gentle barrel aging. For me their most expressive wine is the ‘Goldberg’, made from 50 year old vines which the granddaddy planted in his premium vineyard. Sommer, Neusiedlersee-Hügelland. Leo and Sylvane Sommer’s estate is located in a rather special pocket of the Burgenland, the Leithagebirge which envelopes Lake Neusiedl in the north. Here you can successfully produce the entire spectrum of red, white, and sweet wines. We were first drawn to Sommer’s Grüner Veltliner from the Bergweingarten vineyard. This one is quite voluptuous and has more body, weight, and bite than typical Gruners. Sommer also produces a floral, deligthful Gewürtztraminer and his un-oaked Chardonnay is second to none. Rosenhof, Neusiedlersee. Finally, I want to mention the Haider family from the Rosenhof estate. The Rosenhof or Court of Roses is a multi-functional viticultural and culinary oasis in in Austria’s ‘Sweet Wine Paradise Illmitz’ at Lake Neusiedl. Four generations (!) of Haider family live here and welcome visitors to their restaurant, winery, and hotel. The unique location at the shallow lake creates the special conditions necessary for ‘noble rot’ or botrytis. This is a fungus which attacks ripe grapes around harvest time. Grapes infected with noble rot will develop wonderfully complex delicious flavors. That’s the secret behind this region’s spectacular richness of Prädikat sweet wines like Beeren Auslesen (BA – berry selection) or Trocken Beeren Auslesen (TBA – dried berry selection). You owe it to yourself to taste some of these surprisingly stunning. Which states are you distributed in? Up until now we have concentrated on our home markets in the San Francisco Bay Area and Los Angeles and Southern California. We have started to build a distribution network and today we have partners in several states: Arizona, Illinois, Michigan, and New York. We are interested in expanding the distribution of our wines and are actively searching for candidates on the West Coast and in other key markets. To be honest, distribution is a difficult business and finding the right partner is the key to success. See my descriptions of individual producers. Austrian wines are incredibly versatile when it comes to food pairing. You can apply at least two different kinds of rules. The first is the old adage: What grows together goes together. So anything locally grown and produced will pair well. Take the famous Schnitzel which only needs a great Veltliner or Riesling to sing. I always have what I call ‘Welcome Wiener Schnitzel’ when I arrive in Vienna and it always tastes great and brings home the message that I delved back into Austrian wine & food culture. We have Central-European inspired restaurants in San Francisco like Suppenküche and now Gasthaus Leopold which offer a range of Austrian wines on their list and of course they pair beautifully with their menu of Spätzle, Schnitzel, and Sauerkraut. The second rule is that Austrian wines work extremely well in particular with Asian cuisine. This is true for both, white and red wines. The popular nouveau Vietnamese restaurants Slanted Door, Zadin, and Le Colonial in San Francisco have the Rosensteig Grüner Veltliner and Sprinzenberg Riesling from Geyerhof and J.Heinrich’s Goldberg Blaufränkisch on their list. These wines enhance the flavors of dishes such as their famous Shaken Beef, a green Papaya Salad, or the yummy wood oven roasted manila clams. I have been always amazed that a wine from an Austrian vineyard is so worldly that it pairs seamlessly with the cuisine from such far away and so different cultures. But it works well and is a sure testament to the global reach of any fine wine. Austrian wine is on a great track: The country has very favorable growing conditions, its wine makers possess excellent competence and skill sets, and the entire society cherishes good wine, food, and culture. It is up to the rest of the world to enjoy these fabulous wines and make them part of our lives. I want to congratulate the Austrian Wine Marketing Board for the award by a German publisher of wine magazines and books. Under the direction of Willy Klinger Austrian Wine Marketing has systematically and consistently build a great reputation and image for Austrian wines all over the world while maintaining a dominant position in their own wine market at home. It takes foresight and understanding to design and manage an organization like this and to provide it with sufficient funding from multiple sources including federal and state governments, regional organizations and associations, and the producers themselves. The quality of the work of the Austrian Wine Marketing is greatly responsible to bring the products of relatively small family producers from small Austrian villages and towns to international metropolitan markets like Berlin, Zurich, and London, as well as Tokyo and Shanghai, New York, San Francisco, and Los Angeles. They also keep expanding the reach of Austrian Wines into the increasingly important internet space with a multi-language web site, a visible face book presence, and interaction in other social media. 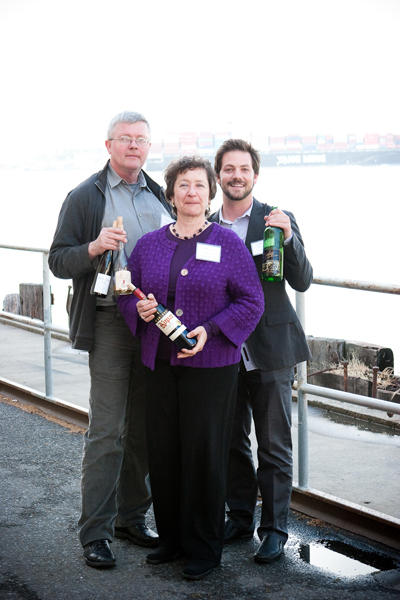 Bravo and Thank You for the support of our work as importers.